Where’s Millersville?? I reviewed recent maps of the area (for the umpteenth time), did some searching in Google, and looked for place marks in the Google Earth Community. No luck. There’s a Millersville in Kern County, and a few Millersvilles in other states, but no Millersville in or near the Bodie Hills. Then I happened to be browsing the 1909 Bridgeport 30-minute topographic quadrangle. And there it was, at the end of a dirt road, overlooking Bridgeport Valley, just north of Potato Peak. Looking at the area today, in Google Earth, I see the scars of old prospecting activity (cinnabar mining at the “Alta Plana prospect”, not sure when), some colorful geology, and not far away, some nice stands of trees—perhaps mountain mahogany (Cercocarpus ledifolius), and a small stand of something else—perhaps limber pine (Pinus flexilis). Must go there. 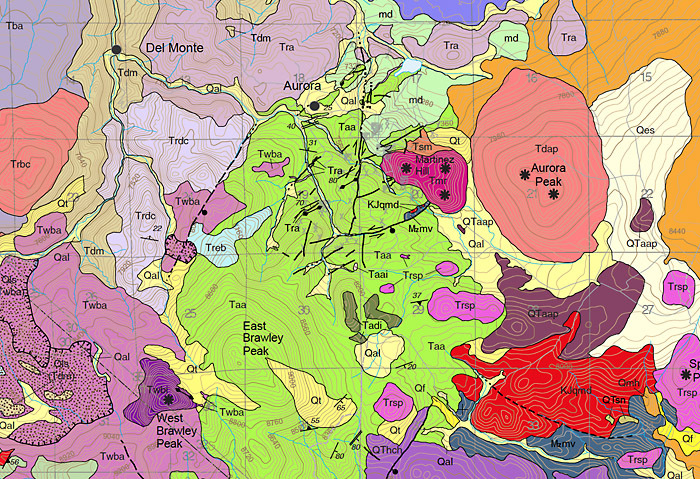 The U.S. Geological Survey has just published a detailed and beautiful new full-color “Geologic map of the Bodie Hills, California and Nevada.” The map can be downloaded for free, here: http://pubs.usgs.gov/sim/3318/. Map Sheet 1 is the map itself, and Map Sheet 2 is the explanation of map units. Several other files provide related information. The Bodie Hills are mostly Miocene and Pliocene volcanic and sedimentary rocks, with a variety of Quaternary surface deposits. Granitic basement rocks, mostly Cretaceous and Jurassic, are prominent in the Masonic Mountain, Aurora Peak, and Rattlesnake Gulch areas. As a teaser, here’s a small part of the map, showing the Aurora–Brawley Peaks area. Full citation: John, D.A., du Bray, E.A., Box, S.E., Vikre, P.G., Rytuba, J.J., Fleck, R.J., and Moring, B.C., 2015, Geologic map of the Bodie Hills, California and Nevada: U.S. Geological Survey Scientific Investigations Map 3318, 64 p., 2 sheets, scale 1:50,000, http://dx.doi.org/10.3133/sim3318. Map-making is a big part of my day-job (at ICF International in Sacramento). 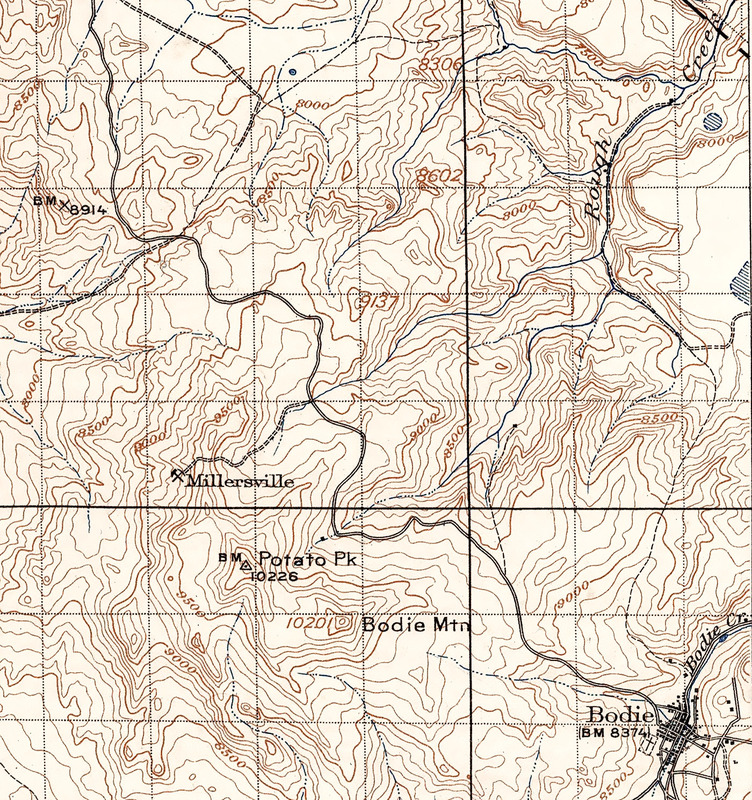 I’ve loved detailed maps since I was a kid, especially maps of wild places in the mountains and deserts of California and elsewhere. 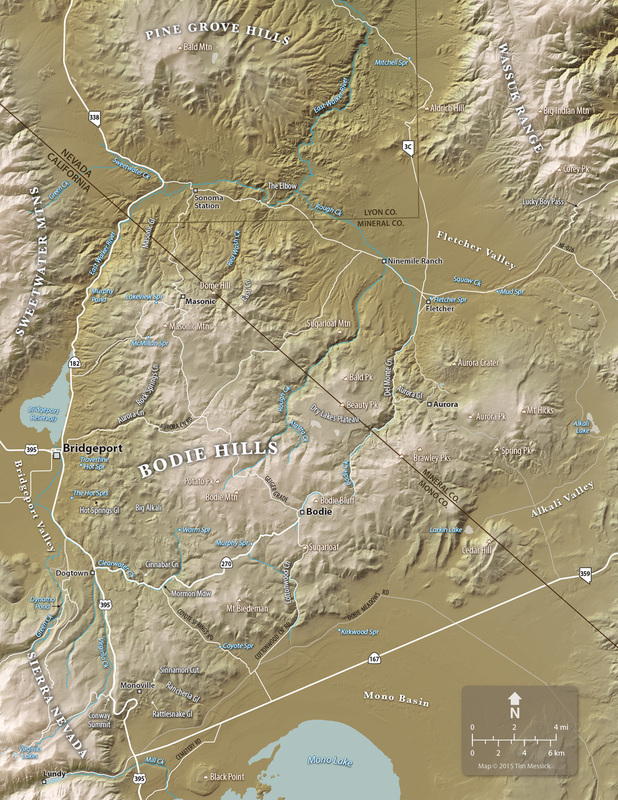 So naturally, I want to make a nice map of the Bodie Hills. Several others exist already (see links below), but I want to make my own for this book on the plants. Here’s a current (March 2015) draft of the map, and below are some notes on how it was made. This map was built in Adobe Illustrator, with help from Adobe Photoshop and two great cartographic plug-ins: MAPublisher for Illustrator, and Geographic Imager for Photoshop, both from Avenza Systems in Toronto. The shaded relief background was created using digital elevation models (DEMs) from the The National Map. DEMs are a special image format wherein darker pixels represent lower elevations and lighter pixels represent higher elevations. Geographic Imager enables Photoshop to interpret this as a shaded relief image with the light source set to any angle and elevation. Geographic Imager also lets you create custom color gradients to help distinguish low, middle, and high elevations within the map area. The roads, water features, and boundaries on the map were added using georeferenced vector data (shape files and KMZs) downloaded from various on-line sources of GIS data. Some of this was organized and edited in Google Earth Pro. These data and the georeferenced shaded relief image were all brought together using MAPublisher, which turns Illustrator into a very functional and designer-friendly Geographic Information System — a really nice tool for cartography. The labels were all added in Illustrator, which gives you complete control over the appearance of text and other artwork. These can be downloaded for free from the USGS Map Store Map Locator & Downloader page. This is a great resource, but it’s a little complicated. On the Locator Map (see the screenshot above), zoom in to the area north of Mono Lake, select the “Mark Points” mode, click on a quadrangle to make a red pin appear, then click on the pin to get a list of available maps. Scroll through the list (which is in descending chronological order), and click on the file size in the “Download” column to start downloading a PDF of the selected map. The newest maps are very recent. The oldest are less detailed and cover larger areas, but are more than a century old—interesting to compare with today’s roads, towns, and place names.